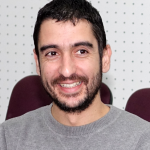 Dr Pavlos Fanis is a staff member of the Molecular Genetics Function and Therapy department of the Cyprus Institute of Neurology and Genetics (CING). He graduated from the Molecular Biology and Genetics School of Democritus University of Thrace (Greece) and received his PhD in 2011 from the Cell Biology department at Erasmus MC in Rotterdam. The main topic of his dissertation was the functional proteomics analysis of transcription factor networks in erythroid cells. In 2012 he joined the Molecular Genetics Thalassaemia Department of the CING and worked as a post-doctoral researcher on an RPF funded project and the “THALAMOSS’’. On those projects Dr Fanis studied the molecular mechanisms of erythroid development and especially the regulation of γ-globin in β-thalassaemia and HPFH patients. Since 2016, Dr Fanis works at the Molecular Genetics Function and Therapy Department of the CING dealing with the genetics of congenital adrenal hyperplasia, puberty, cystic fibrosis and hereditary recurrent fevers. He has participated in various scientific conferences with scientific posters and oral presentations, and his research has been presented in various peer reviewed journals.